There is no room for error when an 80-metre-long vessel needs to come close to a 90-metre-high wind turbine to transfer personnel, equipment and spare parts. To ensure that navigators react optimally, ESVAGT has run a number of DP Workshops for SOV navigators. ‘Constant training is part of ESVAGT’s core, and the workshop will help ensure the quality and safety of our DP operations’, he says. ‘ESVAGT developed the SOV concept and we probably have more knowledge about SOV operations than any other shipping company in the world. The DP operations experience with wind turbines that we have built up with the 'Esvagt Froude', the 'Esvagt Faraday' and the 'Esvagt Njord', is unique. It also means that ESVAGT's SOV navigators working with DP every day need to learn from each other in order to learn something new,’ says Asger Stürtzel Sørensen. 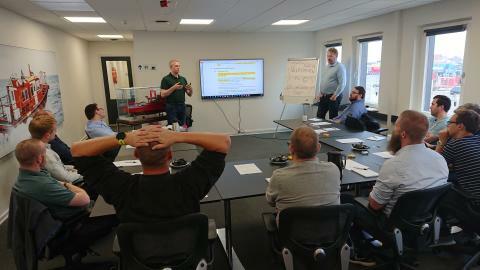 One of the tasks set for the workshop participants has therefore been to define and work with an ASOG; an Activity Specific Operational Guideline, which will ensure that prime operational experience is shared internally within ESVAGT’s fleet of SOVs. ‘We also want to create a thorough training programme and a standard for risk assessment. The best way for us to do that is to involve our specialists who have a thorough understanding of the job from their everyday work, which are our DP Operators’, says Asger Stürtzel Sørensen.